Facebook quarterly profit more than doubled as its ranks swelled during the past year to a mammoth user base of nearly 1.6 billion, it said Wednesday. 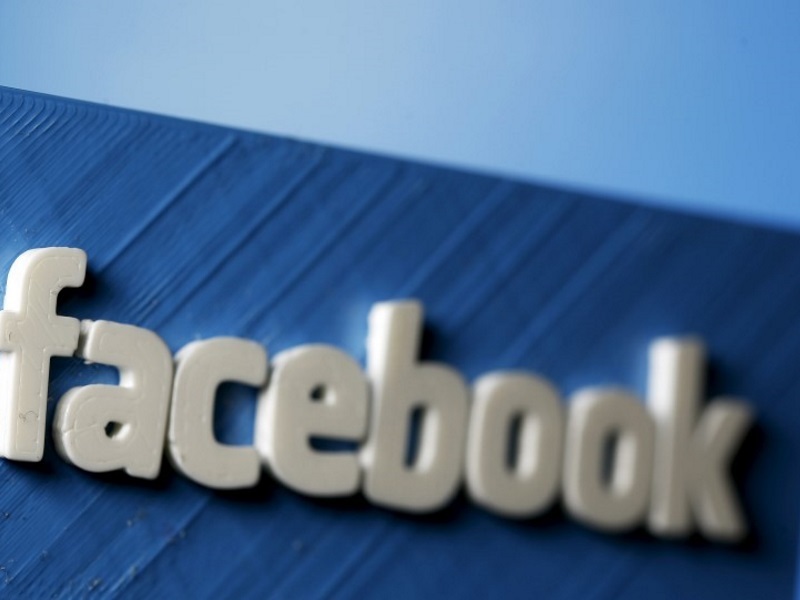 “Our community continued to grow and our business is thriving,” said Facebook co-founder and chief executive Mark Zuckerberg in releasing quarterly results for the world’s biggest social network which comfortably exceeded expectations. It reported a profit of $1.56 billion in the final three months of 2015 as compared with making $701 million in the same period a year earlier. Revenue in the quarter that ended on December 31 rose to $5.84 billion from $3.85 billion the prior year. The results showed Facebook’s growing power in online advertising, especially on mobile devices. Mobile accounted for about 80 percent of the network’s ad revenue in the quarter. Net profit for the full year climbed to $3.7 billion from $2.9 billion in 2014, while revenue jumped to $17.9 billion from $12.5 billion. 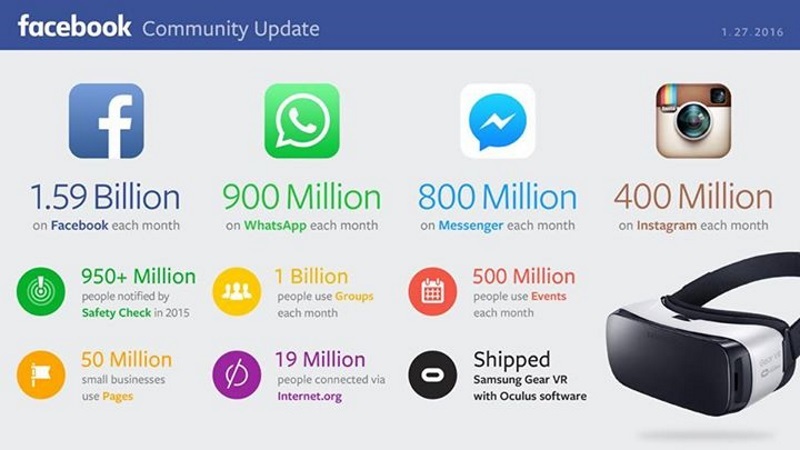 “2015 was a great year for Facebook,” Zuckerberg said. An average of 1.04 billion people used Facebook daily in December in a 17 percent rise from the same month the prior year. The number of monthly active users in December was 1.59 billion, in a 14 percent climb from a year earlier, according to the social network. Facebook shares soared more than 12 percent to $106 in after-market trades that followed release of the earnings figures. California-based Facebook has been relentlessly innovating to keep its social network tuned to Internet-age lifestyles. The company has been working its way into online commerce, honing ad technology, ramping up video, and even dabbling with building machine smarts in its Messenger smartphone messaging application. Facebook-owned Oculus this month began taking orders for much-hyped Rift virtual reality head gear, set to begin shipping later this year. Zuckerberg said during an earnings call that he is happy with pre-orders for Rift, which was priced at $599, but did not disclose specifics. “It is ultimately going to change the way we communicate and live and work in addition to how we play games,” Zuckerberg said of virtual reality. Also this month, Facebook announced a drive to be a place for sports, with a new online hub for news and sharing on sporting events. The “Facebook Sports Stadium” will offer live updates of scores, posts from friends and commentators, as well as information on where to watch games live. Facebook also recently announced an agreement with Nielsen to improve how it measures the social media impact of TV shows, a useful means of assessing the size of an audience. Nielsen created an indicator called the Nielsen Twitter TV Ratings in 2013 after long being criticized for failing to adapt to the changing ways in which people watch television. It allowed Nielsen to measure the number of Internet users sending tweets while watching a program, and also the number of people who see those tweets. Now this tool is being expanded to include Facebook comments. Industry tracker eMarketer expects Facebook to continue to dominate when it comes to online display advertising. It expected Facebook to bring in $9.86 billion in US display ad revenue this year, capturing 30.6 percent of the money spent on those types of ads in the country. “Everything we hear from agencies and marketers is positive,” said eMarketer principal analyst Debra Aho Williamson.